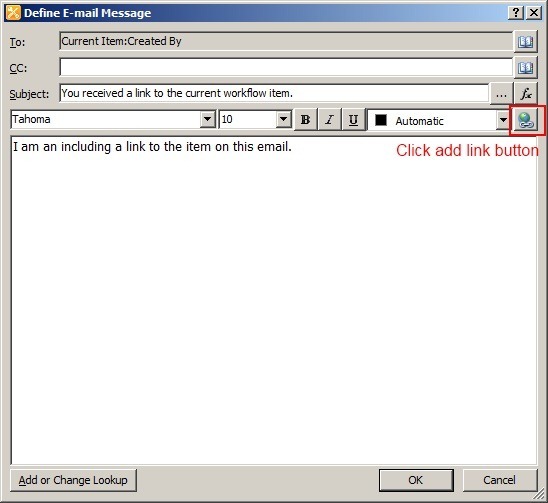 Originally posted on: https://briantjackett.com/archive/2011/02/18/sharepoint-designer-2010-email-link-to-item.aspx#644784Great post. I’m getting a weird result: I set up a workflow to cc: recipients and the ID is different in each e-mail! For example, the first recipient gets a link with the correct item ID or URL, 510, which is correct and functions properly. The second and third recipients get a link to 511_.000 and 511, respectively. Neither of these links exist. It looks like SharePoint’s doing some logical operation in the background. Any idea how to thwart it so people who are cc’ed get the same link? 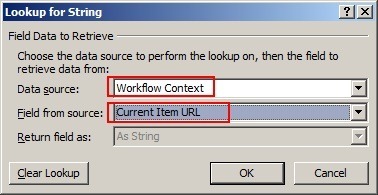 Originally posted on: https://briantjackett.com/archive/2011/02/18/sharepoint-designer-2010-email-link-to-item.aspx#645157Very useful post, thanks! 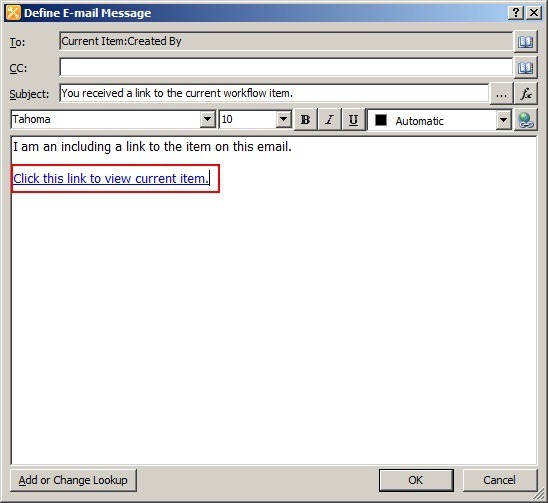 I have a query though – suppose the email alert is being designed for new document additions to a library, how can I also add a link to the library itself (apart from a direct link to the document)? I can’t find a field in the workflow designer that links to the library name for the file in question.I’ve looked everywhere but haven’t found a solution for this as yet, hoping you can help! 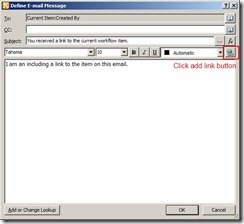 Originally posted on: https://briantjackett.com/archive/2011/02/18/sharepoint-designer-2010-email-link-to-item.aspx#645323Why does MSFT make such simple things so complex? Thanks for the post – just what I needed. Originally posted on: https://briantjackett.com/archive/2011/02/18/sharepoint-designer-2010-email-link-to-item.aspx#645685Awesome thanks!!!!!! Originally posted on: https://briantjackett.com/archive/2011/02/18/sharepoint-designer-2010-email-link-to-item.aspx#645837THANK YOU SO MUCH!! Worked like a charm after lots of frustration. I’m using Office 365/SharePoint 2013, SharePoint Designer 2013. Perfect solution! Originally posted on: https://briantjackett.com/archive/2011/02/18/sharepoint-designer-2010-email-link-to-item.aspx#647126Thank You,You are awesome!!! Originally posted on: https://briantjackett.com/archive/2011/02/18/sharepoint-designer-2010-email-link-to-item.aspx#647806You rock! I had been going crazy on that and my search came right to your solution which works perfectly. 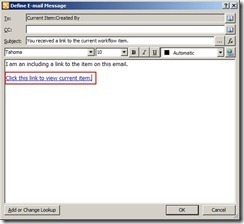 Originally posted on: https://briantjackett.com/archive/2011/02/18/sharepoint-designer-2010-email-link-to-item.aspx#648237hi,Is there an option to reply to a sharepoint by email and for the workflow to change a variable status based on this reply?for instance- if the reply should be “approved” or “rejected” – can it use the word typed in the reply email to change a variable status in the workflow?thanks! Originally posted on: https://briantjackett.com/archive/2011/02/18/sharepoint-designer-2010-email-link-to-item.aspx#648470Thank you!!!!! Originally posted on: https://briantjackett.com/archive/2011/02/18/sharepoint-designer-2010-email-link-to-item.aspx#648948Thanks for posting this Brian! Still helping me years later! Originally posted on: https://briantjackett.com/archive/2011/02/18/sharepoint-designer-2010-email-link-to-item.aspx#649320Thank you so much for this. Huge workflow finally works – just couldnt figure out to get this link.